It is wedding season, not only am I trying to organise my own wedding, I am dancing the night away at other peoples. Usually in badly chosen footwear. It is all confetti and Prosecco this time of year. You receive invites with excitement and then think in a panic, what on earth do I wear?! Church weddings, weddings in fields, beach weddings. There are always unspoken ‘appropriate’ outfits for each occasion. But are there BAD choices for wedding clothes? Of course. Never white. I always see pictures pop up in my Facebook feed of friends going to weddings in white dresses and I tut tut. Avoid questionable hemlines. Keep it classy, you are not clubbing and hopefully you will avoid picking the same colour as the bridal party. Your best friend’s wedding is not the place to debut your new sequined romper. Black is slimming but for funerals, slip into something more colourful! Never upstage the bride, she secretly wants you all to look terrible. Buy clothes that you can wear again, that are attractive, but comfortable, it is going to be a long day. If you are going to church you might pick a hat, but then you have to think of the evening, so you need day wear that can be suitable for the dancing later. Never wear new shoes and take blister plasters whatever you do! So where do you shop? Previously I have ended up trawling round the high street getting ever more hot and irritated and usually spend much more money than I intended to hunting down matching accessories. Quiz has just launched a new section to its clothing website, offering a stunning range of occasion wear that offers everything you need to look gorgeous for a special event. The website offers affordable fashions, next day postage and a simple search by style, colour and price. A godsend in the shopping world. How would you describe your look? It’s harder than you think. There was such a variety of choice on the Quiz website. As a challenge I was asked to offer a paragraph describing my personal style from which an outfit was chosen for me that would be perfect as a wedding guest. So what is on the rail? Royal blue glitter lace dip hem dress. Say yes to the dress. A perfect length item. The stretchable fabric hugs the figure, but the dipped hem adds a little more material and the all over lace with a hint of glitter is perfect for evening glamour. Best of all you can buy it for under £50! With pullover dresses you need to remember to apply your make up and deodorant after you put it on to avoid streaks and smudging. The dress has the addition of a padded bust and I would encourage a quick shake to get rid of the surplus glitter. I will always encourage a classy updo, to avoid flat, sweaty hair. Or in my case, as it is so heavy and time consuming to style, go for loose curls with a couple of well-placed clips and pick a good hairspray. 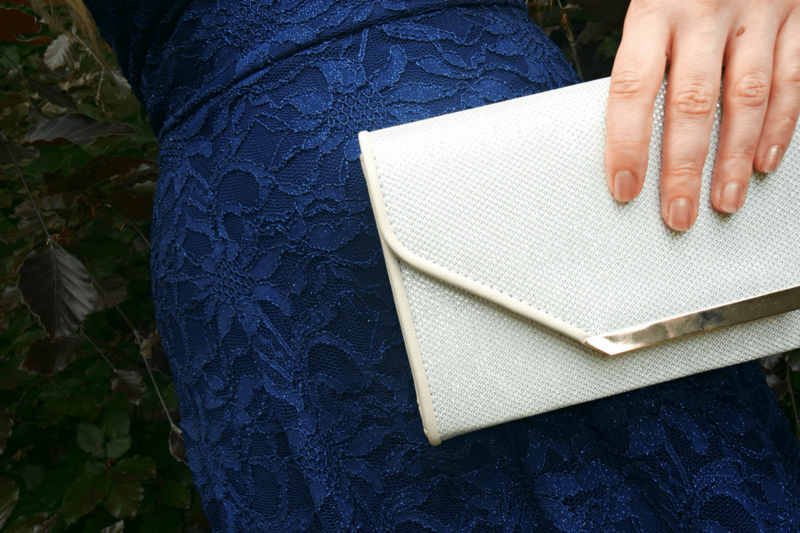 Embrace the occasion with sparkling accessories and an elegant fascinator. You can spend a fortune on these little head pieces. Quiz offer a range of styles and shades. It survived the post without a hint of a squish which demonstrates the good quality. Chosen in a complementary colour palette to the dark blue dress, I replicated the colour on my nails. It fixes with a crocodile clip and is the perfect size and weight. This statement necklace is a lightweight and great all-rounder. With the fascinator and choker I would choose stud earrings as I prefer a more classical, minimal look. The important thing with a necklace is to make sure whatever hairstyle you pick that your locks are not going to get repeatedly caught in the clasp! Additionally, I do not suffer with sensitive skin and can wear any metals, but those who do need to pick their jewellery carefully. No one wants a red rash on their neck halfway through a wedding breakfast. Or the Grand National. A reliable, lightweight handbag with an attractive design is the perfect accessory. I always look for one with an additional strap so it is dual purpose and which has a magnetic clasp, so contents are secure. This buy is the perfect size as you can fit in all the essentials; hairbrush, phone, money, make up etc. In an all over shimmer fabric and gold detailing it is versatile enough to wear with a variety of outfits. What are your wedding outfit favourite wardrobe picks? Do you have a long lasting lipstick that you swear by to wear? Do you go for comfort and take a coat and flip flops or do you brave a pashmina and invest in some good party feet shoe inserts? Note: We received the outfit complementary for our honest opinion of the Quiz website and its clothing.